Brace yourselves: 2015 is here. Whether 2014 was an awesome year, a year to forget, or somewhere in between, it’s a great time to hit the reset button and start over again. I love this time of the year for a number of reasons -- it gives me a chance to reflect on some of the amazing things God has done in my life, to turn the page on some of the more painful moments, and to chart a new course for a new year. I’ve been putting off going to graduate school since I got out of college. But the last year or so, I’ve had an opportunity to continue my education while working full-time. I’ve let that opportunity sit there for too long, and I’ve made it one of my goals to begin pursuing a master’s degree in 2015. What have you wanted to start for a long time? What’s been holding you back? Starting something new can be challenging and frightening, but it could also become the most exciting and rewarding thing you've ever done. Maybe you want to get healthy. Get a gym membership and start going a few times a week (and keep going in February!). Maybe you like to write, but you’ve been keeping your material and your ideas to yourself. Start that blog and put yourself out there. Maybe you’ve been going to church on Sundays for a while, but you haven’t made an effort to get more actively involved. Start volunteering, start serving and join a small group. Whatever it is you’ve been holding off on, just take that first step and get started. Maybe you did start something last year, but a little thing called ‘life’ got in the way and that goal got pushed to the back seat. It happens. But now you have a chance to get yourself back on track. If you put your plan to get out of debt on hold, start chopping away at it again today. If you planned on losing 30 pounds but only lost 10, get back in the gym. Just because the year ended and you didn’t hit the mark doesn’t mean you have to give up for good. Now’s the time to pick up where you left off. Don’t let discouragement keep you from crossing the finish line. This one’s the tough one. We all have that one thing that keeps us from achieving all that we want to achieve in life. Maybe it’s more than one thing. As a writer there are a number of things that distract me from getting my work done on a regular basis, television being a major culprit. Not that Netflix is necessarily a terrible thing, but I can easily spend hours upon hours binge watching my favorite shows and lose valuable time that could be used to finish something of my own. I have to ask myself: Is watching two to three hours of television a day helping me become the man that I want to become? Whether it’s a bad habit, a negative relationship, or a million little things that add up, we often have to give up something in order to gain something greater. Don’t allow something that brings you down keep you from the best that God has in store for you. Don’t settle. It’s time to take out the knife and cut some stuff out of the picture. One of my goals for 2015 is to get to a point where I can wake up three hours before the workday begins without a problem, which means I’m going to have to set my alarm an hour earlier each day. Why? Because early in the morning is the only time I can be ‘selfish’ with my time. It’s the only time during the day when I can truly do what I want to do without distraction. I can write. I can pray. I can go to the gym. I haven’t been happy with the results I’ve been seeing in a number of areas in my life recently, and if you want to see a change in your results, you have to change something. It could be your routine, your thoughtlife, your diet or your schedule. Maybe it’s all of the above. If you see something that needs changing in your life, take the initiative. Don’t wait. Don’t put it off. If you’re reading this, thank you. Last year at this time I hit the “reset button” and made the decision to commit to blogging in a way I hadn’t done so before. The response has been incredible and I am grateful, and humbled, that you’ve joined me on this journey. 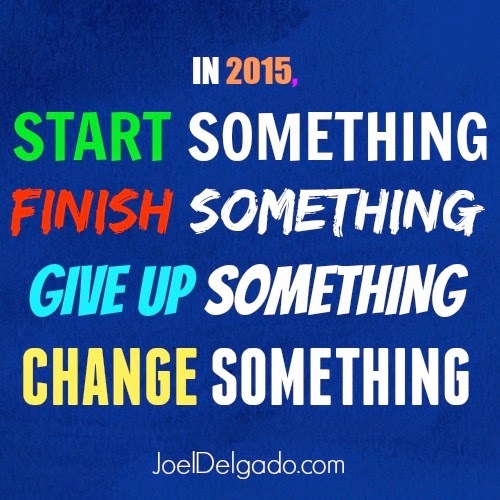 I’m excited to see what 2015 brings! Wow thank you so much! I'm so glad this is the first read of 2015. I'm going to do this thing in Jesus name!